Idram Payment System operates in Armenia since 2004 providing convenience to customers for payments online and offline. The system is operated by Idram LLC (State Registration Certificate), which was granted a license from the Central Bank on December 29, 2009 (License N13 for money transfers). 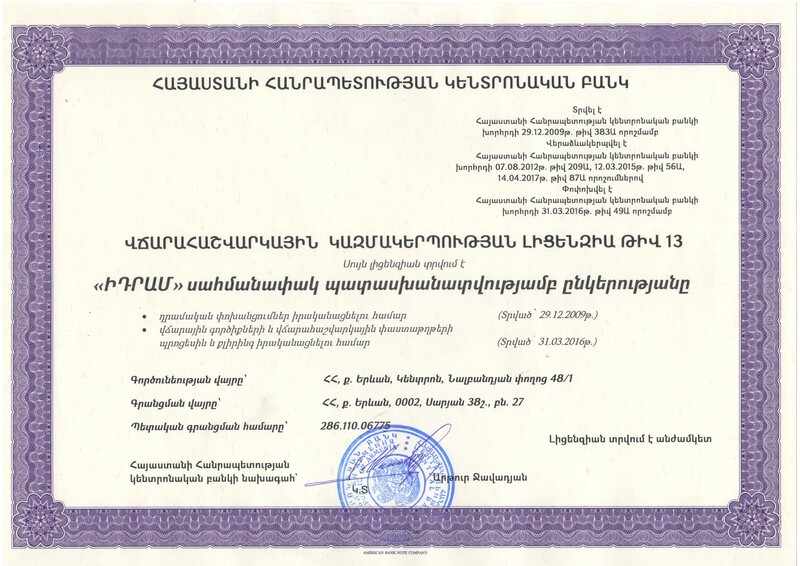 Idram was the first in Armenia to receive authorization from the Central Bank to issue electronic money in 2012. Idram was granted a license on providing processing and clearing of payment instruments, payment and settlement documents according to the CBA Board’s decision on 31 March, 2016. Idram website is available in 3 languages and provides possibility to make online payments to more than 100 service providers. In 2012 Idram introduced the first Armenian mobile wallet, which immediately became the prefered online payment tool for thousands of customers. Mobile application is available on iOS and Android platforms and can be downloaded for free.